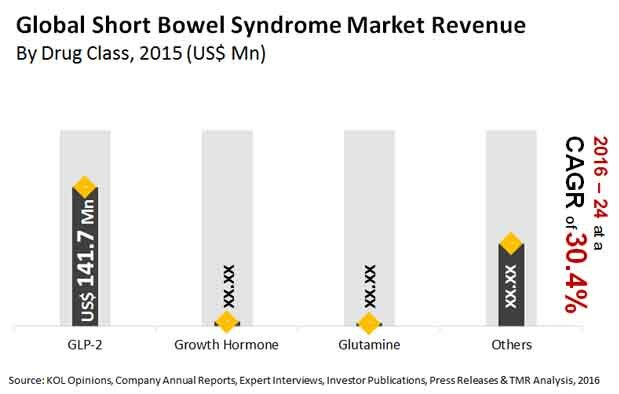 On the basis of drugs, the global short bowel syndrome market is segmented into GLP-2, growth hormone, glutamine, and others. Presently, GLP-2 is leading the global market due to its wide presence in the U.S. and Europe. The GLP-2 drug, composed of teduglutide as the primary ingredient, is sold under the brand name of Gattex in the U.S. and as Revestive in Europe and other international markets. The other drugs available for SBS in the U.S. market are Zorbtive (growth hormone) and NutreStore (Glutamine). However, Revestive is the sole drug designed for specifically treating SBS. Owing to the specificity of these drugs and their wide availability in the regions, these drugs are expected to make significant contributions to the rising revenue of the global market during the forecast period. The drugs currently have an orphan drug status and thus enjoy drug exclusivity that has a growing pool of patients. Presently, this drug has also reached phase III of clinical trials in Japan, which could open up several lucrative opportunities to treat adults as well as infants.